Students - The poem above is simply a true story stretched out as a poem. It is about last night in my living room. In beginning my writing last evening, I decided to read a bit about poetry first. 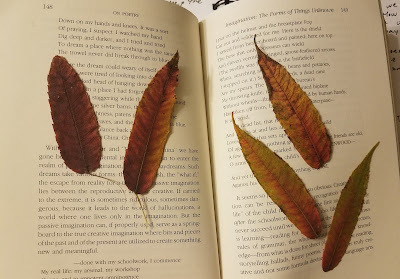 But when I opened my book, I found all of the sumac leaves you see above. I held and touched and thought about the leaves, the tree, the meadow. I often save little mementos of seasons (leaves, pinecones) or outings (ticket stubs, programs) or holidays (cards, bits of wrapping paper). Today I find myself thinking that these simple saved objects might be wonderful writing springboards for many of us. What do you tuck away and save? Did you ever find a wee something that brought back a memory of a specific place and time? If so, you might consider writing about it. You will notice that this poem rhymes every other line....until the last few lines. What happens there? Today we have special guests! I am thrilled to welcome Reading Specialist and Leader in Me Teacher, Alicia McKenrick and her students from Pembroke Primary School in Pembroke, NY. Join Alicia on a journey from eye to finger to brain to heart, from shape to memory to color. In the slides below, teachers will learn how to explore metaphor and analogous thinking with The Private Eye, an incredible resource explained with great wisdom and humor by Alicia. If you are a student and you do not need to learn about teaching writing, please skip ahead to slide 32 and then to 34 and then to 39 and onward. On these particular slides, you will find poems and yarn art highlighting students' fingerprints. You may wish to learn from these models, studying your own fingerprint design as writing inspiration! I extend my gratitude to Alicia and these young poet-artists for generously sharing this beautiful process, for allowing us to enjoy these poems and yarn paintings. It was an absolute delight! Teachers, you may access Alicia's Lesson template referenced in her slides HERE. Linda is hosting today's Poetry Friday roundup at TeacherDance with a celebration of almost-spring! Each week, we gather our posts together at one blog, so if you visit Linda this week...you will be introduced to many new poets and blogs and books. We used loupes everywhere in the field, Amy, but never to look at fingerprints. It's an awesome activity and collection from this class. And I love your poem, a leaf memory sparks a poem, nothing sweeter! Thanks to you and to Alicia and her class. Thank you, Alicia for this awesome tutorial. I was gifted a Private Eye kit from a parent about 8 years ago and I use it all the time. We will be pulling it out in a few weeks to look at my box of "junk" closely as we explore for poetry. I I need to fit this project into my poetry unit-I love it so much! I’m glad you enjoyed it! Thank you for reading! The Private Eye is such an exciting tool. Enjoy your upcoming poetry unit! Oh, my goodness... I was a bit unprepared for the memories that surfaced with this poem. They are specific to western New York....and that is good. I love when I open a book and am surprised by some tidbit I have saved. Of course, I had to listen, because one of my favorite parts of your blog is getting to hear YOU read your own poems. I also read through all 50 slides. I'm intrigued by her process and want to try it with kids. Interesting the way you were able to weave a trip into a poetry book long on the shelf with a memory of sumac leaves. The way you wove your story of the memory rhythmically in lines was a true delight. You make me want to open an old book of poetry...and wander the world around me. I like to collect little artifacts as well. I tuck them between the pages of my dear notebook. Your poem is such a great reminder of how these tiny objects can sweep us away in memories and imaginings. Thank you for sharing, Amy. So much fun to take that detour with you! I tuck treasures into my 10 year diary. So much fun to relive them again years later. Thanks for your sumac inspired poem Amy, and for reminding us to look for things we've hidden away, I find them every once in a while–what fun! What a lovely surprise to open a book and find such sweet memories tucked inside with those few leaves. I LOVE 'meadow memories'. Lovely!